Killer Kitties? Cats Kill Billions Of Creatures Every Year There are as many as 47 million pet cats out hunting for prey. Add that to the tens of millions of feral cats and strays, and researchers estimate that the furry felines are responsible for billions of bird and small mammal deaths every year. The battle between cat lovers and bird lovers has been going on for a long time. Cats and birds just don't mix. But trying to get a handle on how many birds and other animals are being killed by cats isn't easy. Just figuring out how many cats there are is tough enough. "Cats are really hard to count," says Pete Marra, an animal ecologist at the Smithsonian Conservation Biology Institute. He and his colleagues actually got a grant from the U.S. Fish and Wildlife Service to try to estimate the number of animals being killed by people, including through the effects of human activities, buildings and pets. They looked at things like wind turbines, cars, pesticides and — domestic cats. Marra says Americans own about 84 million of them. "And of those, about 40 to 70 percent are allowed to go outside," Marra says. "And we estimate that about 50 to 80 percent of those are actually hunters." That means as many as 47 million pet cats are out there killing prey. Marra says they also looked at cats he calls "un-owned" — feral cats, barn cats and strays. Based on previous studies, he estimates there could be anywhere from 30 million to 80 million of those in the U.S., most of them out hunting. The next challenge was to try to figure out how many birds and small animals all these cats were killing. They looked at all the available data, and when they finished crunching the numbers, Marra says, he was shocked by what they found. Previous studies had suggested that cats kill about 500 million birds a year. Marra's group came up with something very different. 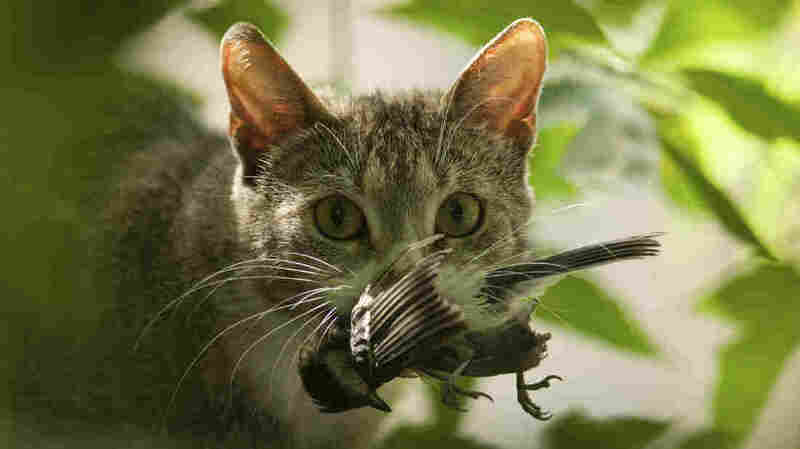 "We estimate that cats kill somewhere between 1.4 and 3.7 billion birds a year," Marra says. "For mammals, it's upward of about 15 billion." Marra says based on those new figures, cat-caused mortality far exceeds deaths from other sources, like collisions with cars or wind turbines. And even though the new numbers are much higher than anything calculated before, he thinks they're in the right ballpark. "We're pretty confident," Marra says. "We felt like we only used the best studies out there. We eliminated studies that had small sample sizes or were only conducted for short durations. And we eliminated studies that had really, really high estimates, or really, really low estimates. So we tried to be as conservative as possible." Marra says most of the deaths are being caused by feral cats, but pet cats do play a role. According to his calculations, pet cats are responsible for about a tenth of the cat-related mammal deaths and close to a third of the bird deaths. He says overall, the number of birds and small animals being killed are high enough that cats and their hunting could be causing some wildlife populations to decline in some areas. But he says it will take more work to figure out which species are being most affected. His study is published in the journal Nature Communications. Earlier versions of this story incorrectly said that previous studies indicated cats kill about 500,000 birds a year. The correct number is 500 million.